GREEN BAY – The Stratford volleyball team will be playing for its first-ever state title in the sport after a convincing win over Living Word Lutheran in a Division 3 semifinal at the 2018 WIAA State Girls Volleyball Tournament at the Resch Center on Friday afternoon. After splitting the first two sets, the Tigers got their offensive rolling at full speed midway through the third set and controlled the rest of the match, going on to a 3-1 victory. Stratford won by scores of 25-23, 20-25, 25-11, 25-16, to remain perfect this season, improving to 44-0 overall. Stratford will take on defending champion Lake Country Lutheran (37-11) in the Division 3 state title match at 11:30 a.m. Saturday. 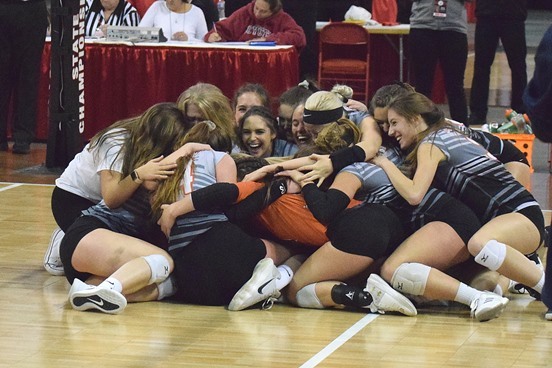 The Tigers, who lost in the state semifinals a year ago at the Resch Center, weren’t about to let that happen again after Living Word Lutheran (29-7) evened the match with a spirited second set. Neither team gained much separation in the first two sets. Stratford trailed 13-12 before tying the score on a kill from Brooke Peterson and the Tigers never trailed again. The Timberwolves managed to tie the game three more times. A block kill by Keri Walker, who led LWL with 37 kills in the match, made it 22-22 before a kill from Mazie Nagel and a pair of Timberwolves’ errors game Stratford in the win. The Tigers were still unable to manage consistent success in the second set and trailed most of the way. Walker had 11 kills in the set for Living Word Lutheran, including four in a row that turned an 18-18 tie into a four-point lead. After Stratford cut it to two on a kill from Lauryn Nagel and another from Peterson, LWL was able to close out the game and even the match. The pivotal point of the match came early in the third set. With Stratford trailing 5-4, a Jadyn Dahlke to Mazie Nagel kill tied it. The serve went to Peterson, and more importantly, Walker was in the back row, and the Tigers took full advantage. Unable to get the ball to Walker, Stratford ripped off nine-straight points on the serve of Peterson, who had two aces in the run. Callie Lehman had three of her six kills in the run, including one on a block, and Mazie Nagel had two kills to put the Tigers up 14-5. Living Word Lutheran never recovered, scoring just six more points in the set as the Tigers won 25-11 to take a 2-1 lead in the match. The fourth set was much of the same. After LWL pulled out to an 8-6 lead, Walker moved to the back row and the Tigers scored 10 of the next 12 points to go up 16-10. Lauryn Nagel, who had 11 kills, and Mazie Nagel, who had a team-high 23, each had two kills in the run. The Timberwolves got no closer than five. A kill by Dahlke and a Living Word Lutheran error finished off the fourth set, 25-16, and sent the Tigers to the championship game against the defending champ. “Because our mental toughness has improved so much over the years, and we have great chemistry, I’m not really nervous at all just because with all the chemistry that we do have, we will click together and do just fine,” Dahlke said. Dahlke had 32 assists, eight digs and five kills, Peterson finished with 17 assists, six kills and five digs, and McKenna Krall had 19 digs for the Tigers. Blaire Lindner added eight kills and Lehman chipped in six in the victory.